These are the first two sections of an essay the concluding instalment of which will appear in the next issue of Poetry Review, 97:3. They will spend most of their time making and elaborating on some necessary definitions and distinctions; the second instalment will look at technical specifics. It concerns itself with that part of verse-making known as ‘lyric’, here used in the restricted sense of that aspect of the art that attends to its music, i.e. to the patterning of its sounds. My intention is to demonstrate that language itself has a lyric basis and is itself a poetic system, and that poetry is merely the natural result of language placed under certain kinds of formal pressure and emotional urgency. I’m of the opinion that it’s impossible to sensibly discuss a single aspect of poetic composition without reference to all others, and I haven’t tried.. I hope the reader will not mistake the tone of relentless asseveration for self-certainty; it’s just the quickest way of provoking disagreement that will allow me to correct my position. This reply to the first part of his essay will be in the same spirit of relentless asseveration. Paterson tells us that the two sections of the first part of his essay will spend most of their time making and elaborating on some necessary definitions and distinctions, and that the second instalment will look at technical specifics. We are then told that It concerns itself with…, and have to check to see what It refers to. After several readings it appears that It must refer not to the second instalment but to essay in the first sentence. We proceed with caution. We are promised some necessary definitions and distinctions in preparation for a second instalment in which Paterson will look at technical specifics. It is to be expected that the necessary definitions and distinctions arrived at will be objective and technical in their own right. It concerns itself with that part of verse-making known as ‘lyric’, here used in the restricted sense of that aspect of the art that attends to its music, i.e. to the patternings of sound. Here Paterson states that the art that he is discussing is verse-making. 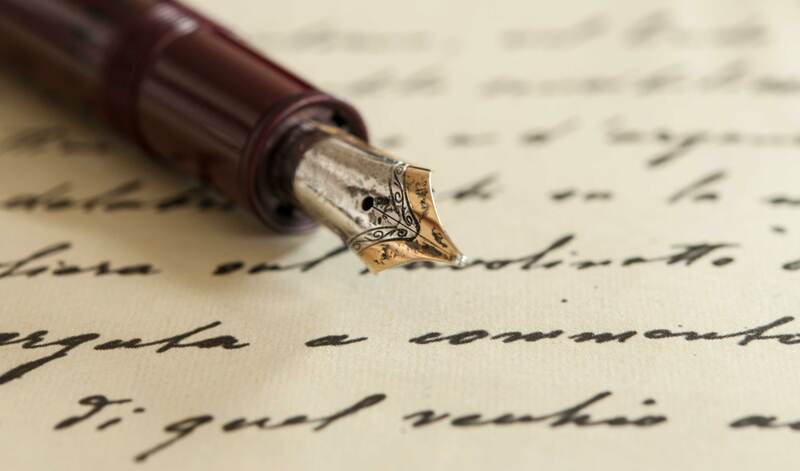 Since the term poetry occurs in the following sentence we may reasonably infer that verse-making means poetry, or is at least a primary defining principle of it. We may necessarily expect some definitions and distinctions in the body of the discourse in respect of verse and verse-making, and of metrical patternings and systems, and ‘measure’. We may next note Paterson’s assertion that there is something called ‘lyric’ (here the word is a noun) that is a part of the art of verse-making. He then goes on to tell us how he will restrict the use of this term ‘lyric’. He ought then necessarily to define for us in this discourse what this thing ‘lyric’ is in its full sense and how in that sense it may be part of the technical process of verse-making. Paterson now goes on to tell us that, in his restricted use of the term or technical factor, ‘lyric’ is that aspect of the art (of verse-making) that attends to its music, i.e. to the patterning of its sounds. In this statement he defines music as a patterning of sounds. We should expect that, if the argument in this essay is to proceed effectively, we will be presented with some description of the general patterning processes and principles in both music and verse-making, with all the necessary definitions and distinctions. Music, as we ordinarily understand it, involves technical concepts of the patterning of sounds such as pitch, melody, harmony, note values and mensuration, bar measures and time-signatures, and rhythms. We hope to be informed how ‘lyric’ in verse-making relates to these principles. Our dominance as a species can be largely blamed on our superior future-predicting capability, a capability derived from and mirrored by the sophistication and length of our memory. Language puts us at a terrifically unfair advantage in terms of forward planning, as it allows us to discuss things in their absence; the biped with the capacity for abstract thought probably wins out all over the universe. The use of the word blamed suggests that we may be in for some sort of moralising discourse about global warming, the extinction of other species, and the part that humans play in this. Then there is some hyperbole about language putting us at a terrifically unfair advantage ~ over what or whom is not stated. However, the paragraph ends up by establishing an idea of poetry as a mnemonic system of information and an invocatory and ‘magical’ art. While its signs are somewhat culture-specific (minor keys, for example, will echo different moods in different cultures) we have managed to map the infinitely complex landscape of human emotion to its weirdly discarnate medium. Here the use of the word signs gives difficulty. Minor keys are not signs in music. Next, we may doubt that an infinitely complex landscape might be mapped at all. And we may ask how many different cultural maps there might be, and how the echo-effects may be conveyed. Further, as to this infinitely complex landscape of human emotion being somehow mapped to any weirdly discarnate medium: this is somewhat overwrought metaphorical and ‘bombastic’ stuff. However, we will continue to search for statements that have some bearing on technical specifics. In para.3 p.58 Paterson suggests that the meanings of words can somehow be yoked together by the careful repetition and arrangement of their sounds. (This may have something to do with the earlier idea of poetry as a mnemonic system of information storage.) In this statement we do not know if it is the sounds of meanings or of words that may be yoked, and how much repetition is required to achieve such ‘yoking’. The matter is somewhat confused by the use of the agricultural metaphor. For a long time [poetry] was, in all likelihood, an art barely distinguishable from song. For one thing, the fixing of an already patterned speech to a repeated pattern of set pitches would aid the memory even further. We are given no idea how such speech may have been already patterned, or how it may then have been fixed to a repeated pattern of set pitches; but we may note the reference in this paragraph to something called pitch height and length and hope that these technical specifics may be developed later. To remember a poem is the poem. In para.6 he talks about patterning in poetry, and speaks about parallel schemes of form, metre and sound. We hope for further development of this scheme and its terms, while asking if parallel is a technical or a metaphorical usage of the word. The poem tends to originate from an emotionally urgent impulse in the mind of the poet, and simultaneously seeks out and is drawn towards forms which reflect and facilitate that urgency. Language behaves in a material-like way, and placed under the dual pressures of emotional urgency and temporal limit, will reveal its crystalline structure and intimate grain. Poetry only exaggerates and makes manifest features already present in the tongue, and emerges naturally from the language as a simple consequence of emotion, and our urge to communicate it; thus language itself can be fruitfully considered as a coherent poetic system. In the course of these statements we find something termed The poem presented as animate, while something termed Language, of which the said poem is presumably composed, is presented as material-like and inanimate. There is nothing in the paragraph of any objective, technical nature, and the conclusion that Paterson draws is not valid. Poetry reveals language’s underlying metrical regularity and its tendency to pattern its sounds. No evidence is provided for this questionable asseveration, ‘sweeping’ as it is. Might Paterson consider the S sounds in the previous sentence of ours to have a pattern or even to display some underlying metrical regularity? A good poem has the inevitability of truth, and it’s hard to conceive of the world ever having been without it. The poem is shaped by a pressured silence; this has rectilinear representation on the page, via the horizontal axis of the poem- and stanza-length, and the vertical axis of the poem. This is absurd. The metaphor might be deemed ‘poetic’ in some respects; but there is no actual way in which a silence may be pressured by anything, nor any way in which an actual poem may be actually shaped by a pressured silence. Even as poetic metaphor it is not very apt. Patterning leaves its parallel effects of lineation, stanza, rhyme, metre, and consonantal and assonantal echoes. Again we have this word parallel. How all these symptomatic artefacts may have effects in parallel as they fill the poem is quite beyond comprehension. A poem cannot be filled like a balloon with air or a bottle with water. In para.12 Paterson the ‘prestidigitator’ performs a neat move. He takes a poem as if it were a coin. He says that on one ‘face’ it displays an inbuilt ‘difficulty’ But you flip it round and its other ‘face’ shows a non-fixity of interpretation. ‘Crazy, man!’ we might exclaim. The white space around a poem then becomes a potent symbol of the poem’s significant intent. The white space is both literally and symbolically equivalent to silence. These statements have no technical or other objective significance: Paterson is merely stating his personal ‘feelings’ in respect of poetry, in a sort of self-important poetic ‘piffle’. Silence is the poet’s ground. It’s silence that delineates the formal borders of a poem, and the formal arrangement of silences that puts the language under the pressure of its form. note the superior attendance to the word the silence insists upon, and how it soon starts to draw out the word’s ramifying sense-potential, its etymological story, its strange acoustic signature, its calligraphic mark. Now, says Paterson, you are reading the word as poetry. It is not a respectable suggestion that we may read any single word as poetry. But we must ask, is it the superior attendance (of whom or what?) or the silence that draws out the words ramifying sense-potential etc? And we may ask if sense- here is something to do with ‘meaning’, or ‘sensation’, or both. The discourse proceeds by way of a disconcerting muddle of terms and metaphor. 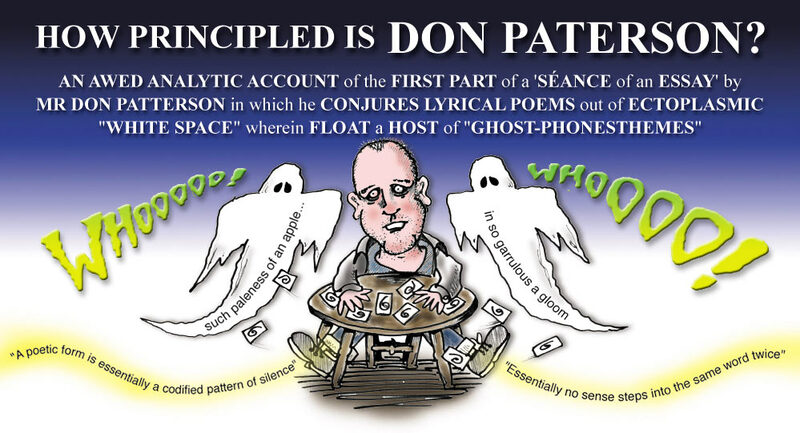 The phrase strange acoustic signature puts one in mind of séances and ‘automatic writing’. Para.15 continues in the same somewhat ‘mystical’ mode. We are provided with the term lyrical patterning, of which no description or definition is given; and then Paterson talks about the spell of the poem. We are undergoing a ‘mystifying’ process. A poetic form is essentially a codified pattern of silence. We have a little silence at the end of the line, a bigger one at the end of the stanza, and a huge one at the end of the poem. The semantic weight of the poem tends to naturally distribute itself according to that pattern of silence, paying especial care to the sounds and meanings of the words and phrases that resonate into the little empty acoustic of the line ending, or the connecting hallway of the stanza-break, or the big church of the poem’s end. These silences are where all the interesting things tend to bunch up, to take advantage of the acoustic salience they enjoy in this position ~ and with which the natural closures of phrase-length and episode tend to coincide. However, we then as it were come down to earth with a bump in a tangle of guy-ropes. We are asked to consider that a poem may have semantic weight and that this weight can somehow naturally distribute itself between the words and phrases.. There may be interesting things and, presumably, [less] interesting things in it. The interesting things then tend to bunch up (perhaps naturally) either in or proximate to (we are not told precisely) the silences which may be standard , bigger or huge according to a codified pattern that is, we are told, A poetic form. No human agency is mentioned, so these processes seem to occur autonomously or be brought about by supernatural and even fantastical forces. This idea is given some support when we remember that such silences are somehow invoked and symbolised by the white page (para.14). In para.17 the word music occurs twice. What we call ‘poetry’ is really a salience. Language has poetry built into it like the body has the endocrine system. The metaphorical reworking of the earlier asseveration in para.7, that Language itself can be fruitfully considered as a coherent poetical system, detracts from the original formulation rather than adding ‘fruits’ to it. The nonsensical notion, built into, renders the assertion of no technical, practical or philosophic use. To save space we may forego making an analysis of every dimensionality of meaning in this trope. We shall only reject as silly nonsense the notion that it is the silence that makes our poems poems. One more musical analogy from Paterson will do no harm, but it won’t do any good. He has not held to his stated intentions. There are no useful definitions and distinctions at all, only an extended mixture of analogy and metaphor. We have been given no clear idea as to what The Lyrical Principle or lyric or lyrical patterning may be. But we come now to section (ii) of the essay, in which there are 17 paragraphs. The first step towards this complexity of implication and interrelation is the minimisation of the number of thematic elements, whose relation cannot deepen in their intricacy and sophistication while the elements themselves multiply. Poetry is the art of saying things once. This is an absurd statement. Saying things once is the general aim of most of our verbal communications, be they letters, technical descriptions or instructions, shouts on the football field, dissertations and critical responses to dissertations, descriptions in novels, or whatever. The most economic and instinctively natural way to then accomplish this sophistication and complexity is through a shift in emphasis from denotative to connotative meaning. However, what information is he trying to give us here? Does the sentence mean that some poems reject the lyric tradition, or reject the shift in emphasis? The word ‘miasma’ comes to mind to describe the effect or mode of Paterson’s discourse. Since poems have to say an awful lot in a short space, connotation is at a premium, as it multiplies relations, not terms; it functions, effectively, as an incredibly subtle and pervasive unifying force, a sort of secret trope of contraction. As I’ll show, we find this reflected in and effected by the poem’s obsessive patterning of sound. By this I certainly don’t just mean rhyme, or loud effects like alliteration, but the use of far quieter patterns often achieved instinctively by the poet and registered subliminally by the reader. These I’ll detail later. The logical and analytical process that Paterson wishes to engage us in would be clearer if such words as awful, incredibly, secret, reflected in, obsessive, certainly, loud, far quieter (this could be replaced by ‘other’) were removed. Further, we observe that talk of obsessive patternings of sound that may be registered subliminally moves the discussion into a somewhat arcane mode. Finally, as a sort of ‘footnote’ to this response to Paterson’s paragraph we would ask, what other loud effects like alliteration would he include in his definitions and distinctions? A word’s strong connotations, its immediate circle of strong aspects, relations and associations, are what gives it its ‘feel’, but not its dictionary definition. The ‘feel’ of words concerns the poet every bit as much as their dictionary meaning.. Overlaps in ‘feel’ between words ~ their shared quality of roundness, shortness, sharpness, bluntness, brevity, lightness, brightness ~ are often betrayed by a common sound, regardless of the sense-realm to which a word belongs. This statement continues to be heretical in certain quarters, but it lies behind the poet’s operative conceit and fundamental article of faith which is that sound and sense are aspects of the same thing. With regard to the first sentence, we should point out that this statement must be taken to refer to all words, and possibly all languages. Next we note that Paterson has put the word ‘feel’ in quotation marks ~ reasonably so, as this is a subjective matter: we will differ in our responses and in the connotations that words may have for us . Now we may note that the ‘feel’ of a word may, again, overlap with that of others, and how very often this overlap is betrayed by a common sound. The word betrayed ought not to be used in a ‘technical’ discourse because it has its own emotional and emotive connotations. Further the word overlap would be better put in quotation marks by Paterson. We come to the fourth sentence. Here Paterson would seem to claim to speak of all ‘poets’ at all times. We may think long and hard to discover if we have an operative conceit and fundamental article of faith that we might possibly share with all poets, that sound and sense are aspects of the same thing. It is nonsense. Whenever we encounter things in nature which share a form ~ a brain or a cauliflower, the sea and a wind in a cornfield, a bean and a foetus, a tree and a nerve, a nerve and a tributary system ~ we unthinkingly assume some kind of analogous relation between the dynamic forces that produced them. By and large such instinctive assumptions are reasonable and well-founded. But for some reason language is regarded as a special case, and we have been instructed to regard many of its sound-symmetries as accidental ~ despite the fact that language, like everything else in this place ~ from the paperclip and the bomb, to the rose and the Cepheid variable ~ naturally arose.. However, when we initially encounter these symmetries, we have no inhibitions in hearing declared not just an acoustic relation, but a dynamic relation of involved sense. You know this when you are three years old, and you go mum / tum / thumb / bum for the first time, and are delighted not just because they all sound similar, but all have the same rounded and warm feel about them. Let us first examine Paterson’s asseveration that we may assume an analogous relation between the dynamic forces that shaped them. The word them refers to a number of pairs of things that he has given by way of examples. Let us take the first pair, a brain and a cauliflower. We would not agree that they share a form; but we might accept that they ‘show similarities of form.’ Next, we would not know where to start in describing the various dynamic forces that Paterson tells us produced them. So we certainly cannot thinkingly or unthinkingly assume any kind of analogous relation between them. But we may question Paterson’s proposition that there may be an analogous relation between dynamic forces that produced, say, a brain and a cauliflower. Urged by him to think about it, we find it difficult to see how whatever forces produced a brain and a cauliflower ~ which forces of growth, or whatever, we might assume to be the same forces ~ may relate ‘analogously’ to each other. Now Paterson moves towards considerations of language, and talks about sound-symmetries. Reading ahead a little, we know that he will be talking about words which sound alike in some respects; so we are warranted to assume that the way in which sound-symmetries work is ‘like to’ or perhaps ‘analogous to’ the way in which two physical things such as a brain and a cauliflower may share a form. Now, we have already suggested that the formula ‘show similarities of form’ is truer than share a form. We may suggest that symmetries is a wrong use of terminology and that ‘similarities in the sounds of words’ would be a better term here. Indeed, Paterson does use the word similar in the last sentence. When as three-year-olds we may rhyme mum, tum, thumb, and bum for the first time, our delight is not simply in the rhyming of the words but in their all having the same rounded and warm ‘feel’ about them. We might call this ‘a dynamic relation of involved sense’. However, we continue to follow Paterson’s discourse, noting that, in the last sentence of his paragraph above, the word feel was not put in inverted commas. The semantic unit in denotative speech is the morpheme; the semantic unit in poetic, connotative speech is the phoneme. That ‘words seem to sound like the things they mean’ is something long understood instinctively, and has been chewed over since the Cratylus dialogue. Yet it’s difficult to prove: because we’re dealing with ‘feel’, we can only point to tendencies, not rules. As a result, even this late in the day, we still have to listen to folk harping on about the arbitrariness of the sign, which poets know to be sheer madness. The first sentence is absurd. It suggests that there is a complete dichotomy between denotative speech and poetic, connotative speech, and that in poetic speech there is no denotative use of language at all. It further implies that denotative speech is entirely and exclusively composed of morphemes and that poetic, connotative speech is entirely and exclusively composed of phonemes. Further, the 2nd sentence implies that all ‘words seem to sound like the things they mean’. This is all beginning to sound like sheer madness. The term ‘iconicity’ refers to the physical sound for a word enacting its referent. taken up with the study of ‘phonesthemes’, which are of particular interest to us: a phonestheme is a point of sound-sense coincidence. Surely, it is the case that scientists, in their various fields, rightly use strictly denotative language in order to achieve accuracy of description and hypothesis and so on? Paterson’s alas, and perhaps also his use of privilege, is denigrative of this use of language. It is interesting, then, to find him, in para.6, leading us into the field of phonosemantics, and making use of its findings and propositions. Before returning to the paragraph there is a further observation that we might make. Paterson has gone to great trouble to write this thesis. He wants us to take it seriously; and, to an extent, he deserves that we do so; but in all fields of research it is customary, when developing ideas, to give sources and references, where available. Paterson provides none at all. How well may we rely on our guide? How seriously should we take him? We may well feel that this ‘mystifier’ is ‘selling us short down a sonorous river’. A standard example is the sound gl which occurs in a disproportionately high number of words related to ‘light’ and ‘sight’ to be mere chance: glisten, glare, glow, glower, glint, gleam, glaze, gloss, glance, glitter. Many words which contain the sound unk ~ bunk, sunk, puncture, dunk, lunk, trunk, funk ~ even though etymologically unrelated, all have a low, sunken, heavy, concave ‘feel’ to them. Some think the number of such phonesthemes is finite; it seems clear to me ~ and I suspect to most poets ~ that the phonestheme is merely the most obvious symptom of a fundamental and wholly pervasive rule of language. Here Paterson would seem to have ‘conjured up’ a wholly pervasive rule of language despite having previously told us that the statement that ‘words seem to sound like the things they mean’ is difficult to prove; because we’re dealing with ‘feel’, we can only point to tendencies, not rules. We are given no sources or references by means of which to enter with Paterson the field of phonosemantics. We must assess his presentation of phonosemantics theory as best we can. In his first example, gl is a sound and is a point of sound-sense coincidence. It occurs in a disproportionately high number of words related to ‘light’ and ‘sight’. There is clearly an interesting clustering. However, before we deal with a particular phonestheme, some questions arise. When we encounter any phonestheme in any word, will processes of a denotative sort be caused as well as those of a connotative sort? We would ask if processes of the association of words and meanings comes into the overall reaction to a phonestheme. We do know, though, that Paterson is concerned with the ‘feel’ of words. He has brought to our attention the ‘fact’ that the words mum / tum / thumb / bum… all have the same rounded and warm feel about them. Are we to assume that the rhyming element um is a phonestheme? It would have been helpful if Paterson had proceeded to deal in greater detail with this example; but, instead, he offers us the gl and unk phonesthemes. Let us now ask Paterson about the gl phonestheme. May it in a general way be thought to cause or take part in actual sensations or perhaps memories of sensations that will then give the words in which it occurs their ‘feel’? Paterson does not make any suggestion as to what is the ‘feel’ of the words in his gl list. Do they not share a ‘feel’, as do the unk words that follow, or the um words which preceded them? Clearly they don’t share it in any simple way. Let us concentrate on the um and unk phonesthemes and ask the sort of questions that probably spring to the minds of most readers of Paterson’s discourse. Why don’t sum and some and scrum and glum and come and dumb all have the same rounded and warm feeling about them as mum etc? The unk phonestheme is also a rhyme element. Regardless of that , we would ask why ‘monk’ and clunk’ and ‘hunk’ and chunk’ don’t all have a low, sunken, heavy, concave ‘feel’ to them? ~ which ‘feel’, bunk does not obviously share either. We may now go through the same process with regard to the gl phonestheme. There are words such as ‘gloat’, ‘glide’, ‘glabrous’, ‘glutinous’, ‘glad’, ‘globose’, ‘glossary’, ‘glove’, ‘gloze’, ‘glib’, and ‘glide’ which do not ‘relate to’ ‘light’ or ‘sight’ or give a ‘feel’ of some sort of literal illumination. We conclude that a phonestheme does not necessarily in any way cause a word to have a particular ‘feel’. Now we may consider that the word phonestheme (which of course might have been spelt ‘phonaestheme’) denotes something that is connected to an ‘aesthetic experience’. Paterson’s word ‘feel’ stands for ‘aesthetic experience’. This experience may be a complex one: in the case of certain unk words we will, according to Paterson, experience in some way a low, sunken, heavy, concave ‘feel’. If we don’t have such an experience in every case, then we must conclude that the phoneme unk is not always a phonestheme. This conclusion follows in the case of the phoneme gl as well. Words seem to sound like the thing they mean. [some] words [may] seem, [in some respects,] to sound like the things they mean. It is, of course, greatly entertaining to ‘dabble in these sonorous arts’, and we will do so, we hope briefly. In Paterson’s list of gl words, we may concentrate on glisten. There is some ‘sense’ in saying that this word ‘has a feel’ (rather than ‘sounds’) in some way like the thing it may mean, in that we may experience ‘ideas’ or ‘memories’ of glistening or glistenings. Now we may ask to what extent the various sounds gl, i and s (or perhaps ss) bring about separately, or in combination, what may be the ‘mental activity’ that we experience as ‘thought’ and accompanying ‘feeling’. (We may note here that in later paragraphs Paterson refers to the short i phonestheme ~ as well as to bl- and -og phonesthemes, and even a -g phonestheme ~ but not to an s phonestheme.) We may further ask ourselves why, if we take the g- phonestheme away from glisten, the word listen does not have the same sort of ‘mental effect’ as glisten? We might now play with the combination ‘listen to the glimmering’…However, we are beginning to distract ourselves too much from the text under consideration. We may now return to the word glum that we introduced above. The word would not seem to be related to ‘light’ or ‘sight’ in any way; nor, as we have noted, does it have the same rounded and warm feeling about it as do mum / tum / thumb / bum. The functioning of phonesthemes is variable and complex ~ when they are functioning as phonesthemes, that is ~ and hardly likely to be susceptible to any systematic ordering. Counterexamples seem easy to give, but prove nothing. This is because language works on a diffuse synaesthetic principle of connotation, a broad iconicity. Sounds evoke things not only in their sound, if they are fortunate to make one ~ but in any aspect: their visual appearance, smell, shape and function. We hear the roundness of moon, the warmth of mum, the ruminativeness of memory, the hiss of sea, the thinness of needle, the lumpiness of hump, the speed of quick. Language works in part by synaesthetic analogue: through the brain’s automatic habit of synaesthetic mapping, ‘brightness’ is a property not only of light, but of sound, shape, taste, emotional mood and so on, and this is reflected in our speech. Poetry, as usual, refines a linguistic tendency to a strategy. It seems to us that, at this point in the essay, there is a change in the process of argumentation, which becomes in some ways ‘denser’, but also ~ to take up Paterson’s own usage here ~ more ‘diffuse’. Our analysis of the rest of this part of the essay will be in some ways more ‘intermittent’. Counterexamples seem easy to give but prove nothing. [some] words [may] seem [in some respects] to sound like the things they mean. The question is, how may such a principle be objectively systematised? Paterson talks of the brain’s automatic habit of synaesthetic mapping, which suggests the possibility of the discovery of some sort of poetic technique that was used by the makers of medieval ‘lyric’ poetry, and Shakespeare, and Blake, and so on. Indeed, he states that Poetry, as usual, refines a linguistic tendency to a strategy. However, the three words that leave the strongest impression on us, when we have read and reread the paragraph, are diffuse, broad, and tendency. One still occasionally meets the objection that a thing or event which makes no sound cannot possibly have a sound to represent it; the trouble is that the ‘definition’ of a phonestheme indicates not rigid designation but a mere statistical tendency, its sound denoting an area of overlapping connotatory sense between several different words. The word ‘meaning’ can’t be honestly used of a phonestheme either, since ‘meaning’ implies a clear denotation; it has no meaning, only a consensual ‘feel’, upon which the words that host it converge. We may here, as it were, make a ‘footnote’ to the footnote. Paterson’s footnote is something of a ‘miasma’ of subjective and metaphorical ideas or expressions mixed with what may be objective and categorical ideas. The footnote would better begin ‘The objection may be made that’.., and the words the trouble is would be better replaced simply by but . The distracting word honestly would be best removed. We again have the metaphor of overlapping to take into account, and a new one in which it is suggested that words may host a phonestheme and converge on one. We may now note that the word ‘definition’ is in inverted commas as if to infer that the only definition given of a phonestheme, that it is a point of sound-sense coincidence, is provisional. A further ‘definition’ is given here: that it is a mere statistical tendency. We must now once again decide what use Paterson is making of the word sense, and conclude that connotatory sense may mean connotations of sensation. Paterson would appear to be saying not that the term ‘phonestheme’ is meaningless but that the word ‘phonestheme’ has no clear denotation. It is said, rather, to have a consensual ‘feel’ upon which the words that host it converge. We may then consider that this formulation may be equivalent to the earlier one, an area of overlapping connotatory sense between several different words. Our understanding of these sentences is nowhere near complete, however, because the word consensual is ambiguous. The word ‘consensual’ has two distinct denotations in the Collins English Dictionary (1979 edition). In the first it is a legal or legalistic usage meaning ‘existing by consent’. In the second it is used of certain reflex actions of a part of the body, and means ‘responding to stimulation of another part’. The next entry is ‘consensus’, which means ‘a general or widespread agreement’. We ask, which of the usages of the adjective ‘consensual’ did Paterson here intend? Has he perhaps conflated the two? Has he been influenced by the noun ‘consensus’? We may suspect that he has conflated or mistaken the two adjectival denotations of ‘consensual’ and also been influenced by the noun ‘consensus’; but even if this consensual ‘feel’ is arrived at as a result of some sort of ‘reflex action’ according, perhaps to a diffuse synaesthetic principle of connotation, we still need some verification of it, some ‘consent’ to it, a ‘consensus’ (if broad) between the ‘poets’ on behalf of whom Paterson is so often ready to speak, or between ‘phonosemanticists’, or both. Has he obtained any such consent or evidence in respect of any instance of a phonestheme? This ‘play’ is little more than another counterexample, and proves nothing; but it is indeed ‘troubling’ that so much in this essay depends upon the concept of the phonestheme. We may take the attitude that, in the field of phonosemantics, the phonestheme is an hypothesis that is undergoing experimental testing. Paterson has been adding a sort of scientific ‘gloss’ to his vague discourse on ‘patterning’ and overlapping connotatory sense. He may yet find a way to make some demonstration and verification of a wholly pervasive rule of language that will enable us to better assess the poetry written over the last 1,300 years, and to write better poetry of our own. However, the paragraph proves to be something of a ‘cul-de-sac’. The image or metaphor that comes to mind to describe the paragraph is that of a ‘blister’ or ‘cyst’, a fluid-filled extrusion. Paterson names a researcher, V.S. Ramachandran, but gives us no references that we might follow up. He provides us with the ‘poetic’ notion of crosstalk between…sense-centres… He then appends a lengthy new hypothesis of his own. As we now know, new coinages will naturally and unconsciously gravitate towards the active and attractive nodes of certain phonesthemes as a way of deepening their sense. This means that iconicity is ‘strong’ as well as broad.23. I have the suspicion that as language developed, the emergent property of broad and systematic iconicity reified to the extent that it began to exert, through a process of downward causality, a supervenient influence on language itself. The system now positively charged with iconic intent ~ instead of being merely a passively-arising index of shared aspect ~ would then start to exert an active, gravitational pull: words which share the phoneme now exhibit a real, if thin, semantic connection regardless of their initial unrelatedness: that such a sense is apparitional is an impossible accusation in a closed system. As the iconic effect became wholly pervasive, any word, however apparently ‘arbitrary’ in its sound-sense relation, would then exert some tiny influence on the whole system: in other words ‘apple’ starts to sound like an apple, and contributes it s own micro-phonestheme, however weakly, to all other occurrences of the same phonemes in the language, which then all carry the ghost of ‘appleness’, with the valency now primed to increase as the two words increase in spoken proximity. (It’s interesting to speculate whether ‘synaesthetically unseeded’ artificial systems, like John Wilkins’ philosophical language, could ever enjoy a weak emergent iconicity.) Read this way, the phonestheme becomes merely a salience in a disease-of-degree game, and words themselves sit at the convergence of many more influences than merely a couple of governing phonesthemes. Who can say if ‘glue’ has not taken on a little sheen from its ‘unrelated’ gl- bearing ‘bright’ words, or ‘sneak’ a little nasality from sn-bearing ‘nosy’ words ~ or indeed apple from the p- phonesthemes related to ‘pulling’ ‘stealing’ ‘picking’ and ‘quiet noise’. [We may suspect that the proof-reader has been inattentive here, and that there may be a word or words omitted after apple.] Were we able to submit words to the same spectral analysis we can the sounds of musical instruments, we would see an extremely complex additive pattern of semantic overtone, from strong partials to almost impossibly weak upper harmonics. The picture is further complicated because language is a dynamic system, and each word changes according to its contextual employment, i.e. its site-specific sense, and its ‘semantic infection’ from its near neighbours. (This is particularly true in the poem, where context is rigged, and just such ’infection’ is intended by its phonic patterning. Put ‘pale’ and ‘apple’ in the same line and they conjure a ghost-phonestheme between them, and their senses are a little interfused: put them together, and their iconising valencies virtually allow them to form a single new word. I realise I’ve buried this secret formula here so no one will read it.) Thus this spectograph would ~ while perhaps fairly constant to its fundamental of denoted sense ~ register constant change in its upper partials. We have no need to muddy the waters further by introducing other parameters like regional variation and personal association. Essentially, no sense steps into the same word twice. We wonder if Private Eye might serialise this footnote in Pseuds Corner. We see it as a sort of top-hat over which our conjurer has placed his magic cloak, on which is written, in sequins, This is because language works on a diffuse principle of connotations, a broad iconicity. Out of this top-hat he produces white rabbits tinted with various ‘partials’, and indeed, chimeras of various genetically-modified types.. Or we may, noting the phrase muddy the waters, change the metaphor and represent Paterson as God creating his own ‘primeval soup’ on planet Languages, out of which mish-mash he is going to create new linguistic, noded and noduled, synaesthetic life; and then alter the mode to use the idea of a Christmas bran-tub; and then alter it again, to that of the old game of apple-bobbing; and then, finally, see Paterson as a duck dabbling upside down…to come up, for our amazement, with an eel, along the squirming sides of which is ‘graven in diamonds, in letters plain’ the legend: Essentially no sense steps into the same word twice. We might immerse ourselves in this footnote for days, literally; but a few ‘up-endings’ must suffice. First, it would seem that Paterson is contributing a new and probably unwarranted technical term for us in the discipline of phonosemantics, the micro-phonestheme. Any word which presumably hosts such a micro-phonestheme then somehow contributes it, however, weakly, to all other occurrences of the same phonemes in the language. Paterson does not identify the micro-phonestheme in apple, nor does he indicate what may be all the other phonemes to which it may be ‘contributed’. We proceed from this, without any examples or demonstrations to help us, to the idea of the ghost of ‘appleness’. This is fantastic. An image of Paterson in cloak, with wand, appears. Indeed, he has ‘secreted’, further on, something of himself, some almost ‘magic’ token, in this footnote ~ which footnote he began, as is the case in some others, in the first person, I. First, though, we may deal with an aspect of the sixth sentence in the footnote. We observe how ‘asseveration’ has fallen away to Who can say… Who, indeed, if Paterson cannot do so? Then we are faced with the problem of apple not being put in inverted commas as are glue and sneak, and not being said to have taken on anything. More problematic still, however, is the fact that Paterson now posits p- phonesthemes. We surmise that there may be a plethora of phonesthemes that Paterson has not thought it necessary to give us any advice or warning of . So it is that a process of ‘broadening’ and faux-technical ‘bluster’ goes on in Paterson’s provision of definitions and distinctions. Here, ‘coyly coiled’, gleaming and precious, lies Paterson’s favourite little absurdity. It is revealed to us that in certain instances two (or more?) words may conjure a ghost-phonestheme between them. Paterson is here making available to those engaged in the discipline of phonosemantics an even more refined and refining concept than that of the micro-phonestheme. His ‘alchemical’ researches then lead him to the conclusion that there are instances of two (or more?) words which will, when placed together in any literary situation, be virtually allowed to form a single new word as a result of their iconising valencies. There is something exquisitely preposterous about this, and yet something unexceptional in it. We may be reminded of the kenning in Old English, ‘whale-road’, sounded as wãl-rãd. We suspect that Paterson is getting a little overwrought as he labours at his alembic, that he is unwell in some way, perhaps, because he has buried this secret formula here so that no one will read it. We would like to take him away from his alchemical obsessions and sit him quietly in a sunlit orchard, beneath trees full of palely-dappled apples. The denotative meaning of a word is singular; the connotative meaning of a word is potentially infinite, and contains all possible terms. However, those terms are strongly centred upon its core denotation, its designated referent (i.e. the fruit ‘apple’ for the word ‘apple’), and those properties without which this referent is impossible. But beyond that, there exists a penumbra of strongly associated aspects, less strongly consensually fixed than its denotation. We tend to also think of the apple as having the qualities of being round, tree-grown, red or green or brown in colour, and sweet and sharp to the taste (though unlike the inconceivable non-fruit apple, we can conceive, at a pinch, of a square or even a blue one.) These secondary aspects radiate out, weakening in strength as they pass from rigid designation, to consensual agreement, to the random valencies of personal association and memory. Unlike its single and often unique denotation, the set of any word’s close connotations will, of course, contact many terms which will overlap with those possessed by many others: apples share their qualities of roundness and sweetness and redness with a thousand other things. The paragraph prepared us for this ‘ghostliness’ as part of the ‘argument’ by which Paterson has attempted to persuade us to accept his account of processes of ‘interfuison’, ‘broadening’, ‘connotation’, ‘association’, ‘synaesthetic transfer’, ‘semantic infection’ and so on, as he describes how language works on a diffuse synaesthetic principle. The connotative meaning of a word is potentially infinite and contains all the possible terms. He appears to be saying that, for instance, some sort of sense of ‘apple’–ness eventually ‘interfuses’ every other word in the language, however weakly; as will some sort or sense or ‘pale’-ness; and some sorts or senses of ‘vapid’-ness and ‘pretentious’-ness. [Some] words [may] seem [in some respects, through a process of synaesthesia] to sound like the things they mean. 26 An unrhymed Lear, for example, would be an unthinkable horror. We would suggest that the uncertainty that Paterson leaves us in as to whether or not he is speaking of Shakespeare’s King Lear, rather than of the entire works of Edward Lear, is a ‘horror’. An image flits to mind, or an idea begetting a flow of pictures to do with knitting; of knitting unravelling’ even of tricoteuses at the foot of a guillotine, all suddenly dropping stitches…Has a shocking secret been exposed within those inverted commas, which are so much less adequate to enclose and protect, than would have been parentheses, that word ‘real’? It is as if, by some process of upward causality and active, anti-gravitational pull, a palely-apple-coloured ectoplasm and miasmic pall arises. It emanates from the lower ghost-phonestheme, which fades to nothing; then it rises t envelope the micro-phonestheme; and finally the phonestheme itself disappears. In poetry, the semantic blurring is encouraged partly by its tactical elisions, which force the collusion of the reader in its sense-making project ~ but largely conducted by the patterned phoneme, leaving a statement which, while easily paraphrasable in that denotative sense-making part, also has a highly complex sense which is wholly tied to its site-specific physical expression. Poetic meaning pours across the word-boundaries carried by the patterning of its sounds, and often unites its lines as if they were a single word. Because of this, form and content have something of the inseparability we find in a piece of music. We have, however, in our picturing above, caught the right sense of a unifying ‘flow’, and of the semantic bleed between words. You might say that poets are trying to make one big, musically coherent unit, in order to conjure up a thing, a state or relation that is new to language, but whose integrity makes it verifiably true in the heart and mind of the reader ~ with more semantic coherence than the refusal of this lyric strategy could possibly allow. Perhaps we are trying to make one big word out of everything. This means we can trust our ears to do much of the thinking, since we know that if we can tie the word into the lyric weave, its borders have been opened, and its meaning will seep into the entire poem and serve to unify its total sense. Thus the ‘blather’ continues concerning the blurring and bleed that may occur across the borders and boundaries of words in such a way as to conjure up a thing, a poem. We note that this poem has even become almost personified through the use of the pronoun whose. Once more we may remind ourselves that this is a project concerned with making and elaborating on some necessary definitions and distinctions in preparation for the consideration of technical specifics. Everything is driven towards a state of entropy, and yet everywhere matter reflects a weird state of order still inscribed in it by the primal singularity, our unbroken cosmic egg, and falls into wave, sphere, orbit, season and pulse. So do we, and so in turn does our complex system of language, which is as deeply wrought with those symmetric whorls and rhythms and patterns as we are. Poetry discloses all this, and in doing so sings the underlying unit, the same song under everything, the concentric circles that miraculously appear in your coffee mug when you tap the desk. Nevertheless, its sad to find yourself born into a universe founded on the principle of nostalgia. But it’s a good place for elegists, perhaps. Perhaps is, perhaps, as fitting a word as any with which this curious discourse might end. Perhaps is a good candidate for the one big word that Paterson mentions in para.16. Entropy is not the state that we have been driven to, nor do we reflect a weird state of order that has induced us to fall into wave, sphere, orbit, season and pulse: rather, we are ‘bemused’ and ‘disappointed’. Paterson spoke of something that he called The iconising engine. We may borrow and adapt this metaphor, to describe his part-essay as an experimental F1 racing car, built under the new Lyric marque. The car has completed its first, faltering, high-revving circuits of the Poetry Review test track. It seems to us, from the knocking, back-firing, shuddering, erratic progress that it has made, that there is much to be done back in the workshop. Matters of fuel and oil-specifications, carburetion, steering, suspension, wheel-balance, and much more, will need attention before the car is fit to compete in the True English Poetry Grand Essay Prix. We climb out of our own antiquated, battered, British Racing Green car, take off our goggles, and go in search, not of a mug of coffee, but of a glass of champagne. Mr Paterson kindly gave me permission to quote from his essay when I met him in Cambridge on the 28th January 2009. Permission to do so has not been granted by the Editor of ‘Poetry Review’.